Some people can’t wait to tell you how much they don’t care about RGB lighting in their PC hardware. And to them I say this: “OK.” And then, I will walk back into the warm, glowing embrace of the Hue 2 lighting kits from NZXT. Let’s say that you or a loved one already have the perfect PC rig. You have all of the bells. You have installed and updated the drivers for all of the whistles. Crysis at 60 frames per second? That’s a joke to you. Then, what exactly are you supposed to spend your money on to fill that consumer-shaped hole in your heart this holiday? Don’t say “savings” because you know your cash needs to go toward RGB LEDs. Look, RGB is in just about everything these days. I’ve got multiple mouse pads with LEDs around their brim. This is ridiculous. I admit this. But I also love walking into my office and seeing the flashing light show that my rig puts on for my enjoyment. And one of the reasons I enjoy my setup so much is because of the Hue 2 RGB Lighting Kit and the Hue 2 RGB Ambient Lighting Kit. 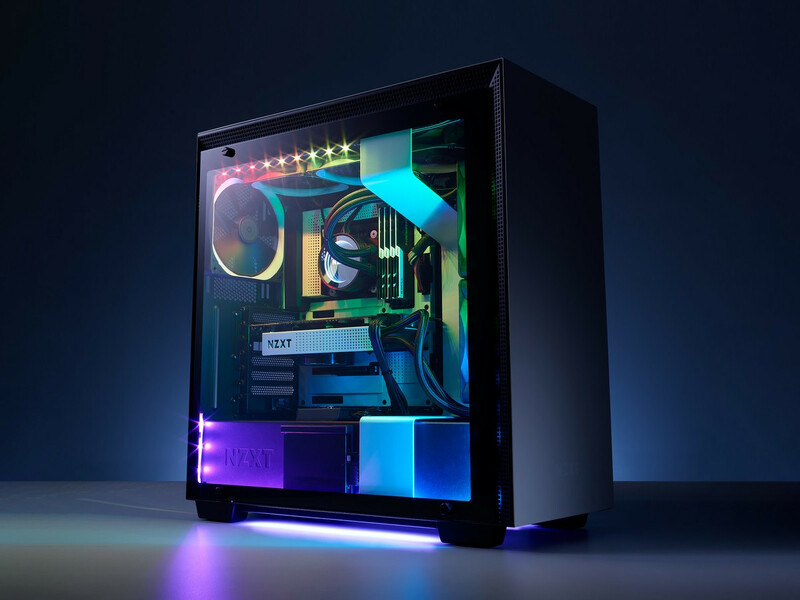 The Hue 2 is NZXT’s RGB hub. It’s similar to the CAM controller that the company includes with the “i” variants of its excellent H500 and H700 PC cases but without support for cooling fans. Instead, this little internal-USB box handles all of your RGB lighting needs. And I like it because it’s easy to set up out of the box. The lighting kit comes with everything you need to bring the pretty, pretty lights to your PC. It has the aforementioned controller hub, the cables, and four lengthy LED strips. All of that is enough to cover every corner of even some of the biggest cases. Installing it is also relatively simple. The strips are magnetic but also include pre-applied Command tape. This means you can attach them to most surfaces in your PC without a lot of effort. For me, the magnets have been enough, and everything has held in place. No drooping or anything like that with the Hue 2. The only trick I had was that I ran out of internal USB connectors due to having the front USB panel, an AIO CPU cooler, and then, the Hue 2. I was able to fix that by picking up the excellent NZXT internal USB controller for $20. It adds a bunch of extra USB connectors. It is also magnetic so that you can install it in an instant. Once you get everything working, the CAM software is easy to use and lightweight. It gives you plenty of options. For example, I have my lights alternating between red and green at the moment to celebrate the holidays. LED strips included: Yes, four 300mm strips and four 250mm strips. The Ambient version of the Hue 2 RGB Lighting Kit is not for lighting the inside of a PC case. Instead, you apply it to the back of a monitor to add even more RGB lighting effects to your room. It comes in a version for 21-inch-to-26-inch displays or one for 27-inch-to-35-inch. Installing this isn’t quite as simple as the other kit. The problem is that the back of your monitor probably isn’t metal. It’s plastic, and that means you have to rely on the Command tape alone. For me, this meant that my strips would peel off by themselves after a few hours. I fixed this by going out and buying some sturdier Command tape of my own for a couple of bucks. But that is an added annoyance. Still, once everything was plugged in. The strips worked exactly like the internal Hue 2. The only difference is that the Hue 2 Ambient plugs into a standard external USB port. You don’t need RGB. But if you’ve read this far, I find it hard to believe that you don’t want RGB. You either do or you are searching for a reason to hate it because you don’t want to spend the money on it. But honestly, RGB is supposed to be fun and superfluous and it is. The thing about the NZXT Hue 2 kits is that they also make it simple. If you are looking for a simple and comprehensive way to add RGB to your PC this holiday, I’d recommend the Hue 2.